Here is another example of the Bedford OB with Duple C27F bodywork. Seen here in the livery of Tanner’s Services of Banbury, she was new in 1950 to the fleet of Grace, Alresford – the town at the ‘country’ end of the Mid Hants line. She’s seen here in the St Catherine’s park and ride car park in Winchester for the King Alfred Running Day on 1 January 2009. HOT 339, was owned by a couple of old friends of mine in Sutton Surrey. We took seats out so when we went on holiday in it we could sleep on the floor! That was in late 60s/early 70s. Coach was in Brown Motor Services livery! The Mid Hants line between Alton and Winchester was regrettably and foolishly closed by British Rail in 1972, by which time it was worked by the SR "Thumper" DEMUs. I travelled on it very many times. The Alton -Alresford section is now the preserved Watercress Line. This OB was new to Grace in 1950, but, in 1952, it was purchased by A. T. Brady of Forest Green, t/a Brown Motor Services. When Brady retired in October 1970, the entire Brown Motor Services fleet and route network passed to J. D. Wylde’s North Downs Rural Transport. I worked for this operator at weekends away from my LCBS desk, in the course of which I drove HOT 339 a number of times. North Downs collapsed in the Spring of 1972, the fleet, by then consisting mostly of Albion Nimbus and Bristol LS types, was dispersed far and wide. Just happened across this thread. Travelled home from school (Holmbury-Guildford) on HOT in 1966 when she substituted for the regular Brady/Brown Bedford VAS 3255 PJ. Glad she’s still going strong. Wonder if Brady’s Nimbus is still around? To fill in some more history of HOT 339. On dispersal from J D Wylde it went to Odd of Cheam (believed to be Dennis Odd) c/72, an early bus preservationist/collector. Then to Whitehead of Tooting (date & use unknown) & to Andy Stopford, Tunbridge Wells for a caravan circa 9/85. It was acquired by current owners, Bill & Connie Barton of Banbury in -/01 who restored it back to a coach. The Tanners livery was a company who Connie drove an OB for in her earlier life. 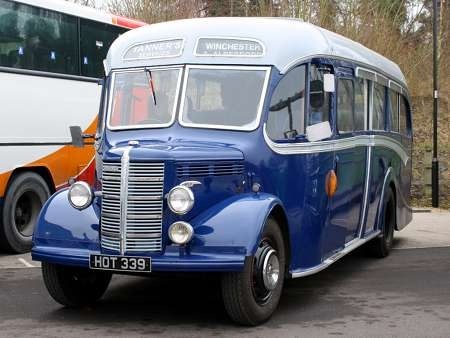 The original operator of this coach, D G Grace of Alresford, trading as Grace Line, took over the local bus services of Blue Bus Services (also of Alresford) between that town and Winchester in 1949. This service operated until 14th August 1953, when Grace Line ceased to trade. After that date, Aldershot & District assumed the monopoly of services between Alresford and Winchester. HOT 339 had operated on the service between the two towns when it was brand new, so its appearance at the King Alfred running day in Winchester in 2009 represented a welcome return to the city for this much travelled coach. Brady’s Albion Nimbus is still about. Owned by travellers I believe. Hot 339 was owned, in the 70’s, by Alan Whitehart, booking clerk at West Sutton railway station and was mostly parked outside the station, which has since been demolished. I used to go to various bus rallies on HOT 339 in her Browns Motor Services livery and Alan would even fire her up to do an all stations run to Wimbledon if a train was cancelled…proper old school raiwayman!